There are several virtues practiced in yoyoing, and not coincidentally they are the same as the virtues for the rest of life. Becoming a great yoyoer takes dedication and hard work, for example, both qualities that garner acclaim in other realms, like school or at work. Another great yoyoer virtue is sharing. It is rare to find a yoyoer who will not let other considerate individuals use their yoyos on a temporary basis. Most yoyoers will also happily teach you any trick they know, even if it means they will no longer be able to brag that they know a trick you don’t. Despite the fact that most yoyoers are quite competitive, this virtue has been a mainstay in every yoyo community I have been a part of. Collecting yoyos is different. Being a former yoyo collector myself, I have some experience in this realm. Here I offer my thoughts for your consideration. First, let me be blunt. There is no money to be made collecting yoyos. To be sure, this will not shock many. 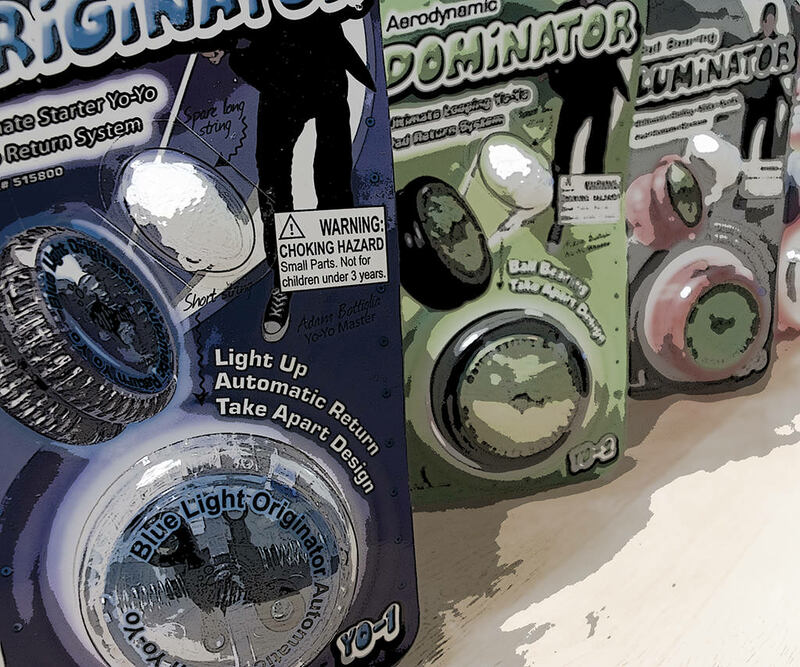 Nonetheless, in that unused, dusty part of their yoyo loving brain, some yoyoers secretly believe that their unopened Luminator will put their kids through college one day. Sadly, this is simply not the case. Even the most rare and sought after yoyos are not all that rare nor very sought after. By the time most people have extra money to spend completing their yoyo collection with some rare yoyo gem, they have already gotten over their yoyo collecting passion and are now spending their money on different kinds of toys: toys like a lawn mower or that new double-wide tool belt with enough room for not one but two hammers, a hack saw, an entire set of screw drivers – English and Metric – and a 10,000 ft. tape measure. This is what I mean by collecting: buying a yoyo with the intent never to use it. Some, as I noted, do this in hopes that they will one day be able to sell it for a considerable profit. This will never happen. Others collect because they like to have things just to show off, to make others jealous of their stuff. “Hey, have you seen the new Hot-Pink Super Hyper-Spin Demon Limited Edition Yoyo. No? Well I have one. Hey, don’t touch it… it’s never been thrown.” I’m gonna give it to you straight. Nobody likes that guy. 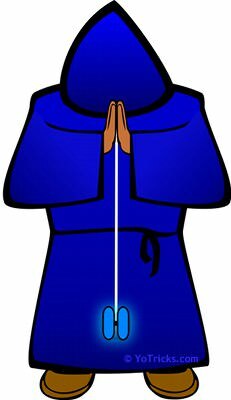 On the other hand, there are some virtuous reasons one may want to have more yoyos than is strictly necessary (which is 1, if you are wondering… 2 if you are two-handing). 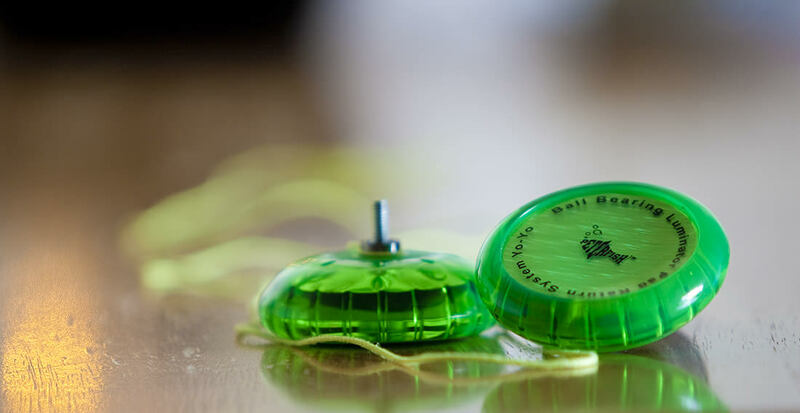 In the Peter Fish line of yoyos, for example, there are different types of yoyos to make learning different tricks easier. Every decent yoyo (and yes, there are decent yoyos we do not sell here) performs just a little bit different, and having multiple yoyos will allow you to learn many challenging tricks easier. A second great reason to collect multiple yoyos has already been mentioned: to share. Having a spare yoyo sitting around is perfect for when you invite over the uninitiated (those with no yoyos), because you can immediately get a yoyo in their hand and begin to teach them tricks. This, of course, will demonstrate that you are a great friend, and in turn will make them a better person… because that’s what yoyos do. Yoyos are meant to be used. They are not meant to sit on a shelf. Use them, share them, give them away. Make the world a better place. Here is a video by our friend Colin Leland (he helped us film the winning video for the SPYY yoyo contest) who has discovered that the lights in the Illuminator function quite well in other yoyos. Secondary bonus: he now has a great new clear Luminator. With the weather starting to warm up around the country may I encourage you to seize the day, or the daylight at least, and take this opportunity to yo-yo outside. Nice weather is a great time to practice your larger tricks like loops and two-handed tricks without the fear of breaking a TV or one of your mom’s prized antiques. Of course, even without antiques and TVs yoyoing outside has its own unique challenges. Humidity can make your fingers feel sticky. Cold can make your hands stiff, not to mention the increase in pain if you happen to hit yourself. Rain will force you back inside. This is exactly why as dedicated yo-yoers we need to take every opportunity to utilize nice days to our skills advantage by practicing tricks that can only be attempted in the wild. 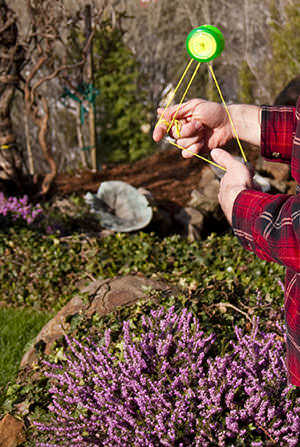 Leave your picture and string tricks inside and expand your yo-yo horizons. Embrace the wind and discover your inner looper. You might just enjoy yourself. Right now I am working on about a half-dozen new tricks: a few one-handed and a few two-handed. I typically rotate through these tricks in any given practice session so that I don’t get too burned out on one trick. Still, there are some tricks that I just have to put aside for a period of time because I have stopped making any real progress. This is usually quite frustrating because I really want to master the trick. However, over time I have learned that putting a trick aside is not always a bad idea. Sometimes you have to let tricks simmer. Much to my delight whenever I come back to these tricks I find them much easier to learn than they were before. Letting a trick simmer is not a magic formula. You cannot work on a new skill for five minuets and put it away for a week and expect to be its master when you return. No. 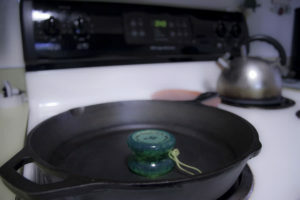 Letting a trick simmer is a last resort. You put in an hour a day for a couple of weeks on a new trick. While you have made small gains it still mocks you in your sleep. You press on undaunted, certain you will overcome. But alas, it is no use. Now is the time to put it aside. How long? If you have been working on the trick for a week, let it simmer for a week, maybe even two. Our minds have a way of working things out in our down-time that we cannot sort through in the midst of the battle. When you return remember everything you learned before and start again. I am certain you will be pleased with the results. There you are, standing in a public place quietly practicing your ever skillful art of Yo. You begin by performing a few simple tricks to warm up, gradually moving on to some more difficult tricks. A crowd begins to gather. This type of scenario will happen again and again throughout your yoyo career. Just remember one thing: be humble. Like all great skills and powers, yo-yoing comes with a responsibility. That responsibility is to have a certain humility about you. 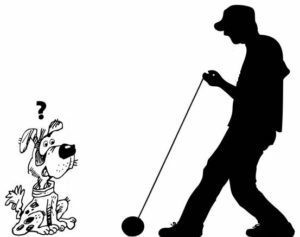 No matter how vapid or absurd a question, such as “Can you walk the Dog?”, may seem in comparison to your main repertoire of tricks, you should never feel too good to perform a simple walk the dog. After all, if walking the dog is what pleases your crowd, why deny them pleasure from such an uncommon skill? … the more your yo-yo will hurt you. Trust me, if anything is true about yo-yoing, this is. Really, it makes perfect sense. 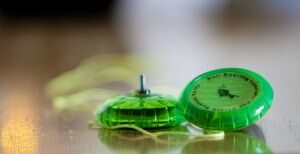 If you are progressing quickly in your yo-yo skills, chances are you are practicing quite a bit. More time practicing means more yo-yo arm fatigue with its corresponding inaccuracy. If you continue to practice after you have worn out all your yo-yo muscles you will find your tricks are a little bit more difficult than before. Your yo-yo will seize this opportunity to come after you. After an hour or so of yo-yo play you will find that your yo-yo isn’t quite as easy to catch on the string as before. After two hours it begins to affect your mind. At first you forget steps in your tricks. Next, you neglect string tension and proper bearing lubrication. This is a key time for knots, broken strings, and yes, pain. This is not to say that all pain should stop you from practicing. Quite the contrary. In fact, the people who seem to progress the fastest have little fear of pain. They have come to see that their yo-yo is not something to be feared but something to be mastered. If that means that it will occasionally strike your knuckles with fury, so be it. A small price to pay for yo-yo mastery. The pain is short lived, but the skills you gain live forever. All that to say, don’t let a bruise or a little blood make you feel like your yo-yo has won the battle. You have entered into a state of accelerated skill. Persevere. You are one step away from becoming the master.